Kelan Martin rises for a jump shot in a game earlier this year. Martin led Butler in scoring and rebounding with 19 points and six rebounds. Collegian file photo. The No. 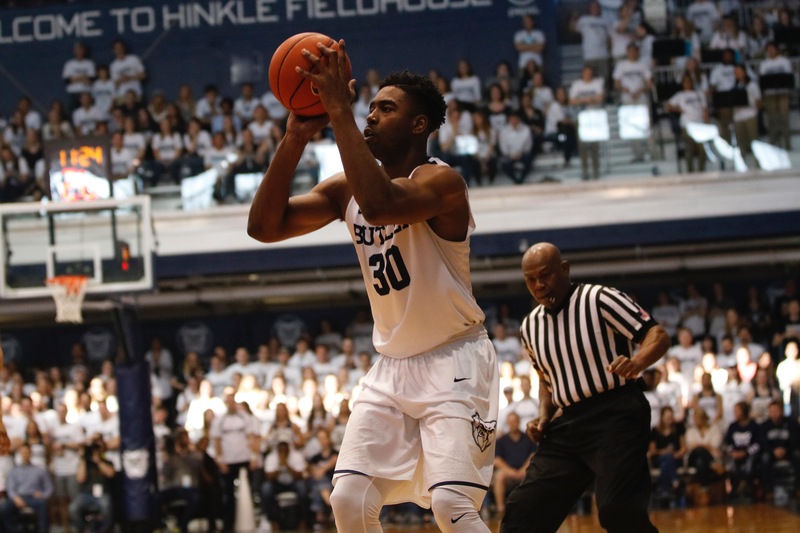 13 Butler University men’s basketball team fell to the Seton Hall Pirates 70-64 on March 4 in Hinkle Fieldhouse. The Bulldogs built a 10 point lead with just over seven minutes left in the second half but failed to hold on for the victory. A decisive moment in the contest came when Myles Powell drilled a wide open three pointer to give the Pirates a 68-64 lead with 37 seconds left. The open look was the result of a scrambled play that nearly resulted in a Butler steal by Kamar Baldwin. Similar to the last time these teams met, Seton Hall (20-10, 10-8 Big East) dominated the boards, out rebounding the Bulldogs (23-7, 12-6 Big East) 35 to 24. Desi Rodriguez, Angel Delgado and Khadeen Carrington carried the offensive load for the Pirates. Rodriguez led all scorers with 21 points. Delgado scored 20 points while Carrington ended with 17. Delgado had a double double as he grabbed 16 rebounds as well. Kelan Martin led Butler in scoring and rebounding with 19 points and six boards. Avery Woodson was the other double figure scorer with 13 points. Woodson was 3-of-4 from three point range. Andrew Chrabascz dished out a team high five assists. ONIONS! Myles Powell with the CLUTCH 3 for @SetonHallMBB! The Pirates shot 49 percent from the field compared to Butler’s 40 percent mark. One category Butler led was turnovers; Seton Hall turned the ball over 14 times compared to eight from the Bulldogs. The lead changed hands seven times in the first half, but the Bulldogs took a 38-35 lead into the locker room. Butler went on a 7-0 run in the last minute of the half to grab the lead. Midway through the first half, the Bulldogs put together a 15-0 run in a nearly five minute stretch. The loss snapped Butler’s five game win streak against Seton Hall and an overall four game win streak in Big East play. Seton Hall and Butler split their regular season meetings after the Bulldogs won 61-54 on Jan. 25 in New Jersey with solid defense. With the regular season now over, Butler enters post season play as the No. 2 seed in the Big East Tournament. They will face the winner of No. 7 Xavier vs. No. 10 DePaul on March 9 at 7 p.m. in Madison Square Garden. The game will air on FS1.